Chard (or Swiss Chard) is so easy to grow, and comes in rainbow colours, stunning shocking pink, crimson, bright yellow, orange or dark emerald green. It can survive a freezing winter, and looks amazing in a garden tub – all you do is pick off the good outer leaves to cook, then lo and behold it grows new young leaves from the centre, ready to pick for salads or leave to grow for such as this Chard Gratin Recipe. Who would have thought that Swiss Chard leaves mixed with cream and parmesan, and topped off with crispy breadcrumbs, could be transformed into the most stunning, rich vegetable dish, perfect to serve alongside such as Roast Lamb, marinated with garlic, rosemary and anchovies, or Roast Chicken, or especially with Venison? Amazingly the stems, even quite thick ones, become very tender and add to the texture of the dish – don’t waste them. But beware, this Chard Gratin recipe is rich, very rich, so usually a couple of tablespoons each are all we can manage in our house! ¾ fill a large pan with water, a big pinch of salt and put on to boil. 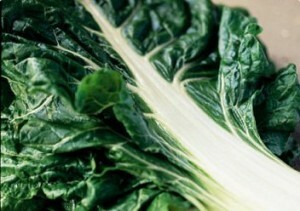 Take time to thoroughly wash the Chard leaves and stems, then cut the leaves off the stems. Trim or tear the leaves in medium strips, and cut the stems into 2 cm /1 inch chunks. Cook the stems in the boiling water for approximately 4 minutes (until they feel tender when pricked), then fish out of the water with a sieve or a draining spoon, and put in a colander. Give a really good shake, then pat dry with kitchen paper. Meanwhile, with the water still boiling, add the Chard leaves for only 2/3 minutes, then remove from the water, add to another colander and press with a wooden spoon against the colander walls to get rid of the water. Pat dry with kitchen paper. Then chop the leaves, fairly coarsely. Add the Olive Oil to a wide pan (a sauté pan is ideal) and add the chopped garlic. Keep the heat low, just enough to colour the garlic, then add the chunks of the Chard stalks. Just cook gently until the stalks feel tender. Grease a suitable baking dish with butter (it adds to the flavour). I usually use a rectangular dish, about 24cm /10 inches by 18 cm / 7 inches. And it is astounding how the chard leaves reduce when cooked in the water. Scatter the Chard stem chunks on the bottom of the dish, then place the drained and chopped leaves on top. Give the nutmeg a good grating, all over the Chard. Swirl the double cream fairly evenly over the Chard, season well (less salt but a good grinding of Black Pepper), then coarsely grate the Parmesan over, enough to give a good covering to the whole dish. Melt the Butter in a frying pan, add the Breadcrumbs and gently mix into the Butter. Just coat the Breadcrumbs, don’t fry them. They will go golden and crisp in the oven. Scatter the Breadcrumbs evenly as possible over the mixture. Have a final light grating of the Cheese, and finish off with a light grating of Nutmeg. Place the Chard Gratin in the oven or AGA for 25 – 30 minutes. Enjoy. This is a great dish, and can be added to. If you wanted a stronger cheese flavour, instead of Parmesan or Pecorino, add grated Gruyere cheese instead. Sometimes I add some Pancetta, cut into bite-sized pieces, gently fried until almost crisp, and placed on top of the Chard, before the cream is added. Or Parma Ham, crisped up and scattered in pieces on the Chard. More garlic can be added, depending on your tastes.